Everyone had a blast churning smoothies with the bike blender at our Community Building Block Party! December 4 marks the second annual Give Where You Live donation drive, hosted by the Kearney Area Community Foundation. Community Partners will be participating, and we have some fun activities planned for the day. Looking for an opportunity to support the community and give your employees an awesome surprise during the workday? We’re currently seeking businesses to partner with us to host giving destinations with our bike blender. 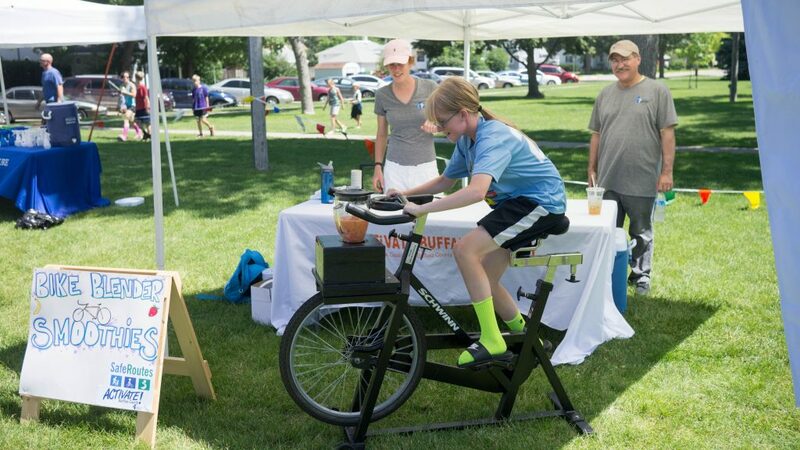 Created for Activate Buffalo County by the Bike Shed, the bike blender is the embodiment of both active living and healthy eating, one of our five strategic directions for improving the health of Buffalo County, and it makes a great smoothie, too! For a donation of $1,000 during Give Where You Live, you will receive: the bike blender showcased at your office (or place of your choosing) for one hour; smoothies for staff and patrons, prepared either by Community Partners staff or your staff; and marketing to promote your location and increase patrons during the hour-long event. Seeing those pedals turn and the fruit liquify is a treat in itself! To see the bike blender in action, visit bit.ly/bikeblender. 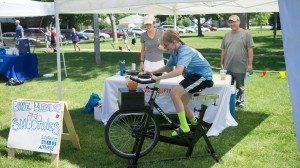 For more information on partnering with us to bring the bike blender to your organization, contact Denise Zwiener at 308-865-2280 or by email. on December 4 or stop by one of our giving destinations to make your donation.